Helmut Lang Re-Edition tank top with detachable sleeves. Amanda Uprichard top in silk georgette. V neckline; self-tie choker strings. Adjustable spaghetti straps. Slim silhouette. Slipover style. Relaxed fit. Amanda Uprichard top in silk georgette. V neckline; self-tie choker strings. Adjustable spaghetti straps. Slim silhouette. Slipover style. Relaxed fit. Made in USA of imported materials. Model's measurements: Height 5'10"/177cm, bust 33"/84cm, waist 25.6"/65.2cm, hips 35.8"/91cm, dress size US 2-4/FR 34-36. Caroline Rose tissue-linen tank top. Scoop neckline. Sleeveless. Side slits for ease of fit over hips. Long, relaxed fit. Pullover style. Linen. Dry clean. Made in USA of imported material. Model's measurements: Height 5'11"/180cm, bust 32"/81cm, waist 25"/64cm, hips 36"/91cm, dress size US 2/4. Shayne Oliver for Helmut Lang tank top in metallic chiffon with gathered hem. Approx. 22"L down center back. Halter neckline. Shayne Oliver for Helmut Lang tank top in metallic chiffon with gathered hem. Approx. 22"L down center back. Halter neckline. Sleeveless. Side zip closure. Silk/polyester. Dry clean. Imported. Model's measurements: Height 5'10"/177cm, bust 33"/84cm, waist 25.6"/65.2cm, hips 35.8"/91cm, dress size US 2-4/FR 34-36. This Joan Vass tank offers endless possibilities for wearability. 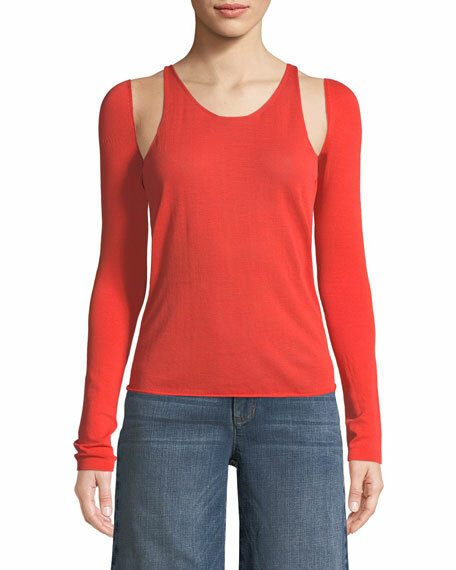 Joan Vass top in ultra-soft 1x1 ribbed knit—your choice of color. This Joan Vass tank offers endless possibilities for wearability. 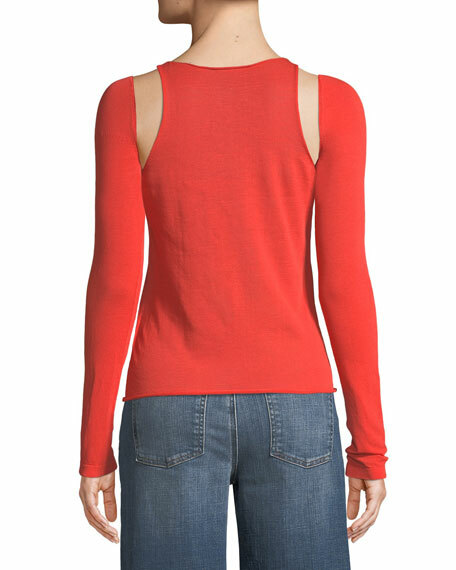 Joan Vass top in ultra-soft 1x1 ribbed knit—your choice of color. Approx. length: 17"L from shoulder to hem; 23"L down center back. Scoop neckline. Wide shoulder straps. Slim fit. Hem hits below hip. Pullover style. Cotton; washable. Imported.